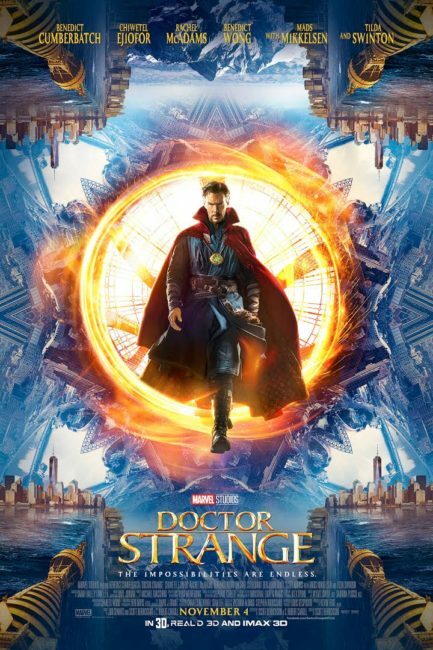 I saw the new Marvel movie, Doctor Strange, this weekend, and I have to say: It’s one of the weirdest Marvel movies yet, but it’s also one of the best. There’s a mystical, magical, spiritual, and psychadelic vibe to Doctor Strange. When I told some friends I was seeing it, I pitched it as “Inception meets Harry Potter.” That’s pretty close, though there’s also a kung-fu Matrix aspect to it that I really enjoyed. One thread woven throughout the movie is about hands. I really liked that. I’ve taken my hands for granted until now. There are several compelling female characters a movie with a male protagonist, but their role is not at all to be rescued or be held as bait for the protagonist. Not a single gun appears in the movie. It’s funny without being comical. There are some genuine laugh-out-loud moments. The ending of the movie is one of the best I’ve ever seen. A big problem is solved in a clever way at the same moment that a character’s development reaches its peak. Also, as I do these days, I watched the movie trailer after I saw the movie so I wouldn’t spoil anything. Overall, the trailer does a pretty good job at not spoiling much, though it still shows things that happen in the final third of the movie, and it spoils one of the funniest moments. This entry was posted on Sunday, November 6th, 2016 at 11:18 pm	and is filed under movies and tagged with movies. You can follow any responses to this entry through the RSS 2.0 feed. You pretty much hit the nail on the head for how I felt about it as well…it was strange…but very good. I thoroughly enjoyed it. I enjoyed it a lot. There’s a weirdness about any Marvel movie, in that if you’re an old-school comic geek like me, you basically know the plot – certainly the origin bits – it’s just a question of knowing how well they’ve done it. I thought they did the origins part brilliantly – the defeat of Dread Dormammu, however, I found trite and OOC. It felt like they’d just pasted Who instead of Strange. Really? The defeat of Dormammu was my favorite part of the movie. I really liked how it showed how far Strange had come as a person since the beginning of the movie, and it was a clever way to defeat a nearly unbeatable opponent. I wasn’t as thrilled with it as I have been with previous Marvel movies. I’m a big fan of Marvel, so I’m pretty lenient towards most of the movies, even the non Marvel Studios ones. But this one felt like there wasn’t much character progression, the main villain felt really flat, Christine felt largely pointless to me. It didn’t feel like it lived up to the Marvel standard. That’s not to say I didn’t enjoy it and Benedict’s performance was better than I was expecting. But overall, it’s far from the best Marvel movie I’ve seen in a while.